They can’t be missed anymore during carnival. For the past few years Brazilian samba bands have become an increasingly popular feature of our Maastricht carnival and can no longer be dissociated from it. But what exactly are samba bands? Where do they come from? And how did they reach our city? 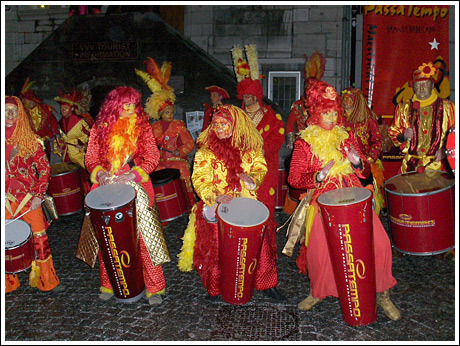 To learn more about this phenomenon I speak with three members of Passatempo, my favourite samba band in Maastricht. Annemieke Brekelmans, Mark Teunisse and Ron Erkens are very enthusiastic in answering all my questions. Especially Mark, who joined Passatempo in 2001, impresses me with his tremendous knowledge of the various styles of samba music. Besides being a member of Passatempo, he is also one of the “ritmistas” of the Casa de Samba in Tilburg which plays authentic samba music from Rio de Janeiro. He is obviously addicted to it! He not only plays samba instruments like the caixa, tamborim and repinique, but also the piano and the guitar. Ron Erkens has been a member of Passatempo since its founding in 1997. He is currently the leader of the band and plays the surdo and repinique. As for Annemieke, she started her career in samba music in 2000 with another samba band called Entusiasta but she switched to Passatempo in 2004 where she plays instruments like the surdo, timba, tamborim and agogo. Samba music was born in Rio de Janeiro, Brazil, in the beginning of the 20th century out of cultural influences and traditions brought over by former African slaves. It became the most important Brazilian rhythm, and it is played in many different forms such as Samba Batucada and Samba Reggae. Mark tells me that other modern music styles like funk, drum ‘n bass, dance etc. also influence the band’s repertoire, but as he embarks on a description of the different samba styles I have to stop him because it gets too complicated for a non-expert like me! I do understand however that Passatempo tries to distinguish itself from other samba bands by developing its own sound. About five typical pieces were written by Eric Janssen and Michiel Westerhuis, and two others by George de Beer. Too bad they are not members of Passatempo anymore.